What happens when expectant parents are overcome by Jubilee fever? What happens when expectant parents are overcome with Jubilee fever? Amidst all the celebrations seen recently with Queen Elizabeth II’s golden and diamond jubilees, I wonder whether expectant parents have felt inspired to mark the occasion? 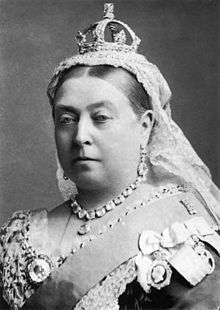 Go back to Queen Victoria’s jubilees and I can find two examples in my family tree. Queen Victoria’s jubilees inspired expectant parents. Photo: Alexander Bassano. George Juble Bishop was born in Wicken, Cambridgeshire as the last of the 18 children of James Simpson Bishop and his wife Ann (née Bowers) in 1887. This was of course the year of Queen Victoria’s Golden Jubilee – which kicked off on 21st June. George was baptised the month beforehand. His mother died when he was 2yrs, and his father when he was 14yrs (in 1901). He appears on the 1901 census living in nearby Cottenham with his older sister Mary Ann Bishop who has since married John Rayment. When he reached 35 in 1922, he is found leaving the UK and emigrating to Australia, where he can be found living in Flinders, Victoria, Australia as recent as 1963, by which time he is in his late 70s. Arthur Jubilee Barber was born in the year of Queen Victoria’s diamond jubilee – 1897 – to Reuben Barber and his wife Elizabeth (née Dewsbury) of Witchford, Cambridgeshire. Arthur was widely known as ‘Juby’ and on the 1911 census, he even appears as ‘Jubilee Barber’ aged 13. It seems that he died in 1959 up in Staffordshire, but this is not for certain – as i seek further evidence to support this. The name itself seems to have been unisex, with a Jubilee Barber marrying Thomas Hockaday in Melcombe Regis, Dorset in 1850. Perhaps this Jubilee was named after the celebrations relating to King George III’s jubilees. Author Andrew MartinPosted on June 5, 2012 June 6, 2012 Categories RoyaltyTags Arthur Jubilee Barber, baby names, George Juble Bishop, jubilee, juby, King George III, names, Queen Elizabeth II, Queen VictoriaLeave a comment on What happens when expectant parents are overcome by Jubilee fever?